Discussion in 'Grappling Technique' started by Poseidon9, Jun 9, 2008. Congratulations goes out to my friend and coach, Cameron Diffley. He was awarded his black belt today by Ricardo Pires. Cameron can be seen as Forrest Griffin's jiu-jitsu coach on this season of The Ultimate Fighter. Come check us out at Legion Jiu-Jitsu in Las Vegas! Segio Penha + Ricardo Pires = Sergio Pires? I've seen this guy on the show. Congrats to him. wow. he has not even had his brown belt for a year, big congrats to cameron. Haha, my bad, was out of it last night... Ricardo Pires. 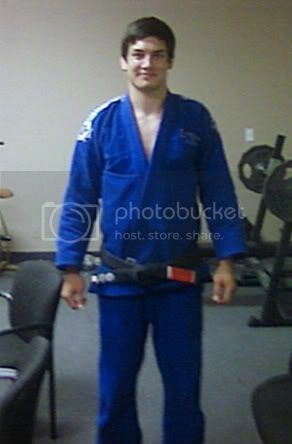 Awesome, I was just looking at training some bjj and tbh legion jj is probably where I'm head to. Was that the guy that beat one of the team take down guys at GQ. But marc laimon said that he wasn't given his points? Yeah, he beat Jake Roshalt to win the 195lb advanced division at the last GQ. Laimon made a big deal of his guy not getting points for passing at the end, but the ref DID give him points earlier in the match even though he did not pass and control for the require amount of time, so it evened itself out. congrats to him, his jiujitsu is solid. Of course, that has nothing to do with being a black belt, so again congrats to him. Wow 5 1/2 years to BB, that's great. Part of the next wave of American BB. I thought he did a very good job in the corner. The Butterfly sweeps he called for worked great. Why do you say that? Tim was getting tooled by GNP in the closed guard. I thought his corner work was solid. If a guy you are cornering is obviously using one game, and you are trying to get him to switch his game in the middle - thats not a good corner. A good corner doesnt yell out general information like "Work harder," "submit him," etc. A good corner should be telling you exactly what to do. Granted, Cameron wasnt that general. However, when the guy you are cornering is obviously trying to play a closed guard game you help him play that game. You dont yell "Go to butterfly" a hundred times and hope all of a sudden he hears you. You say things like "Break his posture, and control his wrists. Set up your sub by doing x,y and z." etc. Matt Serra, for example, was a great corner. Tito also. They gave solid advice, detailed advice, and step by step directions. Cameron was like BJ yelling "omoplata!" from every position possible lol. You need to give the guy a blueprint on how to get there. Most importantly, though, you need to work with the guy. After telling the guy to go to butterfly 87329 times, and he doesnt, you should realize that for some reason he doesnt want to go there. Help him play the game he chose. In the end, no matter what, hes the one thats inside. I 100% believe that with better coaching, Tim submits JT in the first or early in the second round. But when you are trying to work closed guard and your corner keeps yelling "butterfly" and thats it, thats not a good corner. Well thats probably because most people on here dont know what a good corner is. A good corner would have enabled Tim to win that fight, 1000%. Tim was technically superior on the ground by far. Maybe the people who disagree with me didnt see the same fight I saw? Most importantly, though, you need to work with the guy. ...Dunno about that, he gave lots of very specific advice on what to try from the closed guard. The closed guard was getting Tim raped and when, after much badgering from his corner, he switched to butterfly, it definately meant he was eating less leather and in position to scramble more and try different subs.